You only thought FIRST BORN was over! 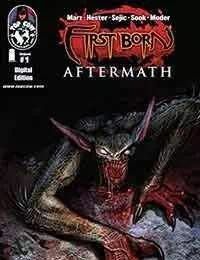 Coinciding with the release of the FIRST BORN collected edition, a pair of all-star creative teams joins forces for two tales that pick up very literally from the ashes of First Born, and set the stage for coming events in the Top Cow Universe in this oversized special. WITCHBLADE scribe Ron Marz (SAMURAI: HEAVEN &amp; EARTH) and Ryan Sook (X-FACTOR) team for a Magdalena story, while THE DARKNESS author Phil Hester (SUPERMAN CONFIDENTIAL) joins with Lee Moder (RED SONJA, PAINKILLER JANE) to introduce a powerful new villain. Add to that a painted sequence by original artist Stjepan Sejic (WITCHBLADE), and this book is ideal for new fans jumping into WITCHBLADE, THE DARKNESS, or the rest of the Top Cow Universe.